Israel Folau has broken his silence after the Wallabies fullback was stood down indefinitely by Rugby Australia. Speaking to Sydney Morning Herald from his Truth Of Jesus Christ Church at Kenthurst, Folau said he is "absolutely content" walking away from rugby if he feels he is forced to compromise his religious faith. 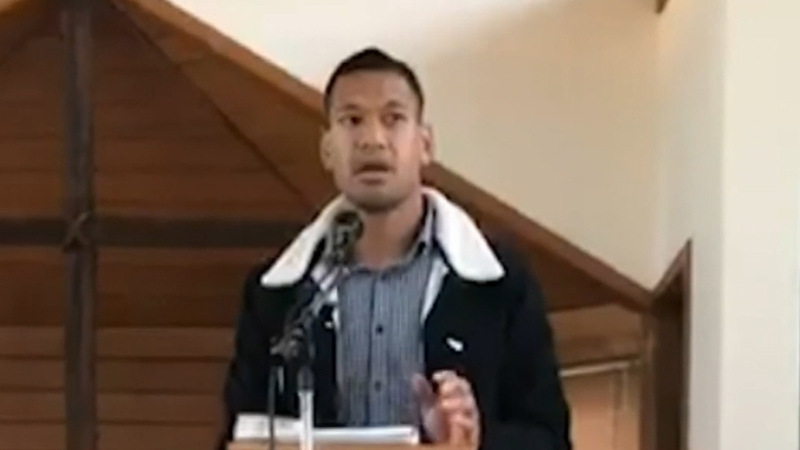 "It's obviously a decision that's in the process right now but I believe in a God that's in control of all things," Folau said, after attending the church with his netballer wife Maria. In his first interview since posting homophobic messages on social media on Wednesday, Folau wouldn't back down on his actions and said he would be prepared to accept his fate from rugby authorities. Rugby Australia is likely to rip up the Waratahs star's lucrative four-year deal for a breach of contract, but Folau had little remorse for his social media activity, in which he said "hell awaits" homosexuals, as well as "drunks, adulterers, liars, fornicators, thieves, atheists and idolators". Folau also posted on Twitter that "the devil blinded" the state of Tasmania, for passing legislation which made gender an optional detail to include on birth certificates. "I'll stand on what the Bible says," Folau told Sydney Morning Herald. "I share it with love. I can see the other side of the coin where people's reactions are the total opposite to how I'm sharing it. "He's a loving God and he wants people to turn away from what they're living in and he'll give them life. "As we heard today, those that live for Christ will be persecuted for his name. So for me, [the reaction] wasn't a surprise. "I have love towards everyone that might be saying negative things. "I choose to love them because God loves me."